It’s finally August, and summer is quickly coming to an end. While we’re sad to see the poolside days and sunny rays go, this ending brings an exciting beginning: a new school year! Get your kids ready for the first bell with these three yummy treats! 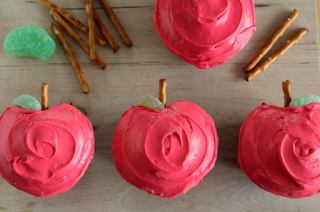 These back-to-school baked goods are perfect as a lunchbox surprise or as a new teacher gift. Did you know the average American eats 2500 peanut-butter-and-jelly sandwiches before graduating from high school? PB&J is not only one of the most famous food pairings in the country, it’s also a school staple! 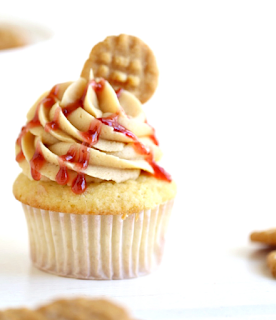 Try these delicious-duo-inspired cupcakes for a surprise snack your kids will never forget! Place 12 cupcake liners into cupcake pan. In large mixer bowl, beat sugar with eggs. Add in flour, baking powder, milk, butter, oil, peanut butter and vanilla. Mix on low until creamy. Place 3 tablespoons of batter into each cupcake liner. Bake at 350 degrees for 18-20 minutes (or until toothpick comes out nearly clean). Cool cupcake pan for five minutes, then remove cupcakes from pan and allow to completely cool. With a cupcake corer or the wide end of a large piping tip, core out the center of the cupcake to make an area for the filling. Place jam into the center of each cupcake, then place a small piece of removed cake to cover jam. Frost cupcakes with peanut butter frosting (recipe below), then drizzle tops of cupcakes with jam and top with a mini peanut butter cookie. In mixer bowl, beat butter for 30 seconds, add in peanut butter and beat to incorporate. Add in powdered sugar and heavy cream and start beating on medium low. Move to high once combined so the powdered sugar doesn't go flying. Place frosting in a piping bag fitted with a star tip. Swirl frosting onto cupcakes. 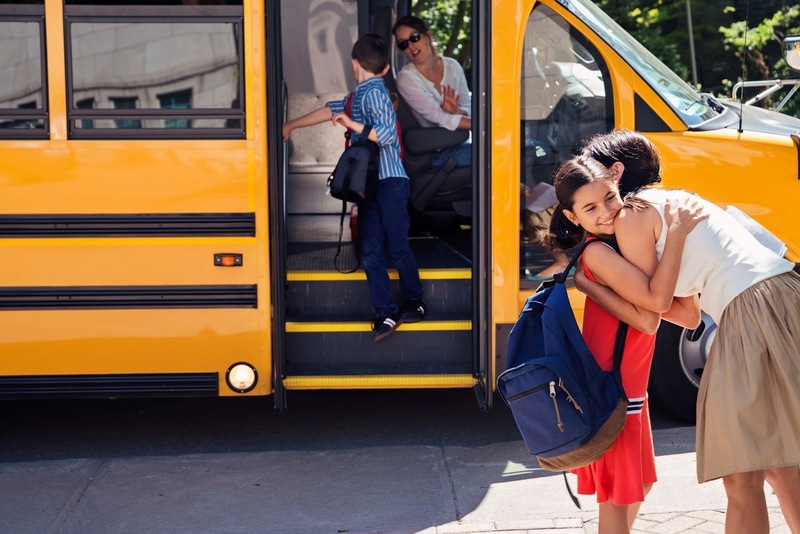 Even if your kids don’t usually take the bus, they’ll love taking these buses to school…in their lunchboxes! These Rice Krispies Treats school buses are as super simple and easy to make as they are cute! Melt the yellow candy melts and add some orange candy coloring to make school bus color. Glue two Rice Krispies Treats together using a small amount of the melted candy coating. Cut one end of the cereal treats to look like the front of the bus. Flatten the Tootsie Roll Midgees (you may need to heat them on low in the microwave for a few seconds to get them soft enough), and cut out small square windows for the buses. Pour or spread your melted candy over the treats. Scrape off any excess candy from the bottom of the treats. While the candy coating is wet, add the Tootsie Roll windows and the Mega M&M wheels. Set the Rice Krispies Treats school buses on a parchment-paper-lined baking sheet and put in the freezer for about five minutes, or until the candy coating hardens. 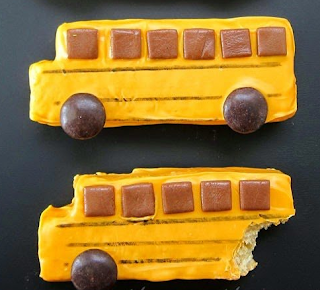 Use a black food coloring marker to add details to your school bus treats. You can add lines or even write the name of the school district on the sides of the bus! At the beginning of a school year, teachers can get so many apples that they don’t know what to do with them all. Switch up your new-teacher gift with these adorable apple-shaped cupcakes! Could showing teacher appreciation be any cuter? Place your cupcake liners in the muffin pan. Roll your tinfoil into small 1/2 inch balls and place into each liner. They might pop out until you have your batter into the liners as well. These tinfoil balls will create the indents on the sides of your cupcakes. Alternatively, you can use a marble! Prepare your cupcake batter as your chosen mix directs. Pour the batter into your liners. Bake your cupcakes according to box directions and let them cool. Remove the tinfoil balls or marbles. Mix up some red frosting and frost your cupcakes. My favorite tool for this is an offset spatula, a small ½-inch-wide one, which is so great for spreading frosting. Using kitchen scissors, trim down your green gumdrop into a small leaf size and place it next to the pretzel, on the frosting to help it stick.